When you delete a page (or post) from your site, you delete one or more URLs too. That old URL, when visited, will usually return a 404 not found error. But is that what you wanted? Maybe that page should be redirected somewhere. If not, and you deliberately deleted that content, serving a 410 header would actually be a better idea. This post explains the choices you have and how to make them. Redirect or delete a page completely? The first choice you have to make is whether or not the content you deleted has a proper equivalent on your site. Think of it this way: if I clicked on a link to the page you deleted, would there be another page on your site that gives me the information I was expecting? If that’s true for a specific page on your site for a majority of the people clicking on that link, you should redirect the deleted URL to that page. When you redirect that deleted page URL to another URL, make sure the redirect you use is a so-called 301 redirect. 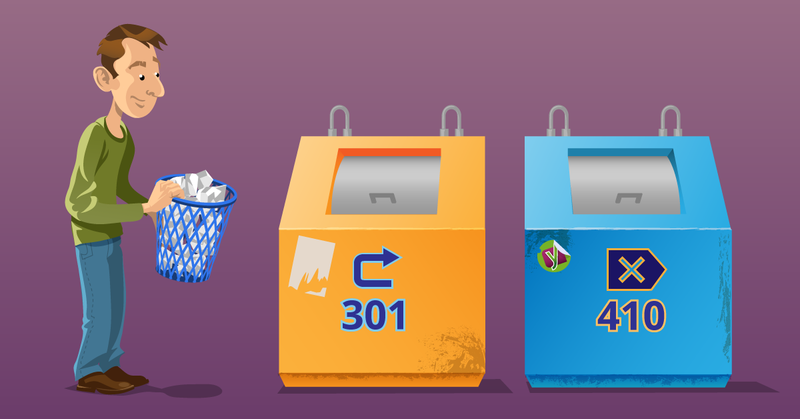 There are several types of redirects, but a 301 redirect is what’s called a permanent redirect. In doing so, Google and other search engines will assign the link value of the old URL to the URL you redirected the visitors too. If there is no page on your site with that information, you need to ask yourself the question: should I really be deleting that page? Or should I just make it better? If you decide to delete it nonetheless, make sure you send the proper HTTP header: a 410 content deleted header. The difference between a 404 and a 410 header is simple: 404 means “content not found”, 410 means “content deleted” and is thus more specific. If a URL returns a 410, Google is far more certain you removed the URL on purpose and it should thus remove that URL from its index. This means it will do so much quicker. If you’re using WordPress and our Yoast SEO Premium plugin, the redirects module in this plugin is capable of serving 410 headers. We’ll make that easier to do when you delete a post or page in an upcoming release. The problem with serving 410 content deleted headers is that Google’s support for it is incomplete. It will delete pages that serve a 410 from its index faster. Yet, in Google Search Console, Google will report 410s under “Not found” crawl errors, just like 404s. I’ve complained to Google about this several times but unfortunately they have yet to fix it. 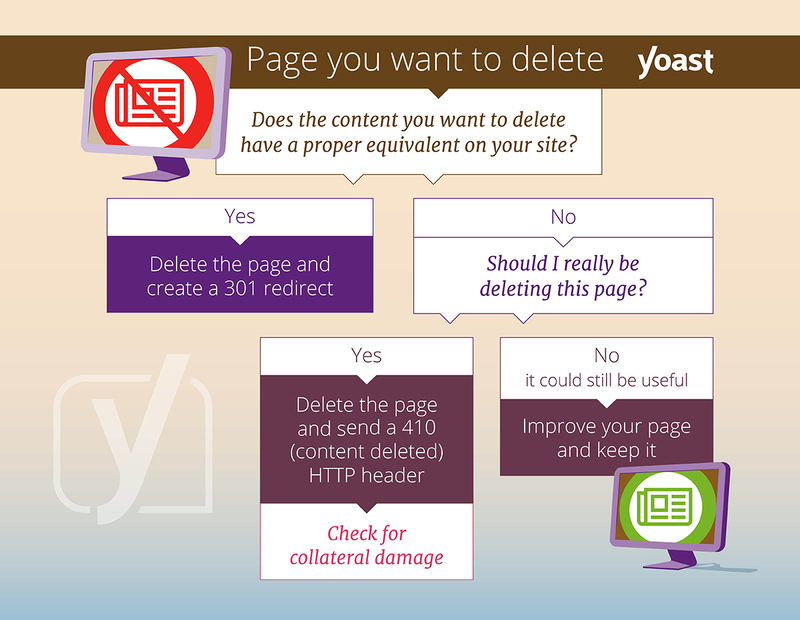 When you delete one or more posts or pages from your site, there’s often collateral damage. Say you deleted all the posts on your site that have a specific tag. That tag now being empty, its archive’s URL will also give a 404. Even when you handle all the URLs of those posts you deleted properly (by redirecting or 410ing them) the tag archive will still give a 404, so you should make sure to deal with that URL too. Even when you didn’t delete all the posts in a tag, the tag archive might now have 5 instead of 12 posts. If you display 10 posts per page in your archives, page 2 of that archive will now no longer exist, and thus give a 404 error. These aren’t the biggest problems in the world when you delete one or two posts, but if you’re dealing with a Google Panda problem and because of that deleting lots of poor content, creating a lot of 404s like this can take your site down even further, so proceed with care!